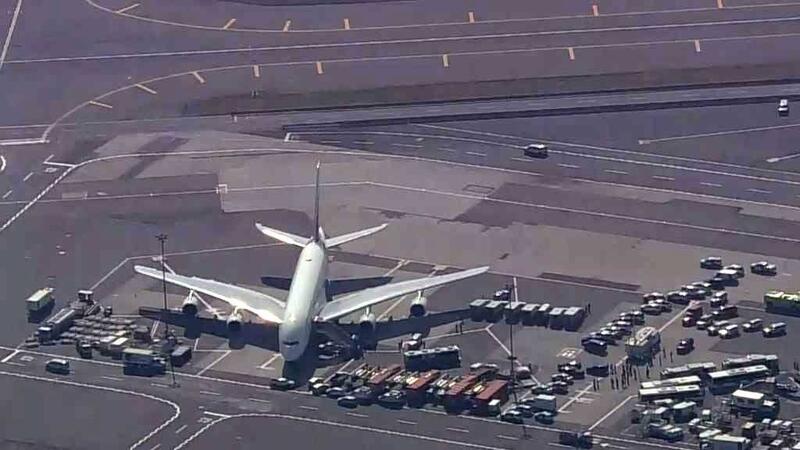 NEW YORK — A commercial jet from Dubai prompted a large-scale emergency response Wednesday at New York's Kennedy Airport after a pilot reported that several passengers and crew members were complaining about having a flu-like illness. The Emirates flight arriving at 9:10 a.m. with 520 passengers was swarmed by police vehicles and ambulances and immediately quarantined for an assessment by the U.S. Centers for Disease Control and Prevention. Passenger Erin Sykes posted video of officials wearing masks and gloves taking the temperature of passengers on the tarmac. The New York Department of Health said Wednesday evening that 10 patients were taken to Jamaica Hospital Medical Center and are stable. Officials said they are not being treated for anything serious. They also said they've taken respirator samples, but believe it is influenza. Final results from those samples will be made available later Wednesday night. The CDC had said earlier that about 100 of the 520 people aboard the plane were being evaluated after complaining of illness, including cough and fever. A government source briefed on situation told CBS News correspondent Kris Van Cleave there was no evidence of a security or terror issue. Emirates' home office has told U.S. officials it believes this incident was caused by food poisoning. However, at least one passenger said that people appeared to be sick before even boarding the plane. Video from news helicopters showed the jet stranded on the tarmac for several minutes before passengers began to emerge. Those who were cleared were put on buses to get to the terminal. "I feel great. I feel fine," she said. "Nobody was alarmed. ... It was handled very well." But other passengers said they suspected that some passengers were sick before they got on the plane and that the airline should have done more to protect others. "Why did they allow them on the flight? ... I sat with them for 13 hours. If it's a virus, we're all getting sick," Srinivasa Rao said. Sykes partly faulted the ill passengers themselves. "These people should know not to travel in a confined space with other healthy people," she said. A manager for Vanilla Ice confirmed that the 1990s rapper was on the flight. Ice, whose real name is Robert Van Winkle, posted a video on Facebook showing the emergency response. On Twitter, he described looking out the window and saw several ambulances, firetrucks and police vehicles converge on the plane. He said that he was thankful he was on the top deck of the twin-deck jumbo jet, echoing Dergham's statement saying the sick people were in a location he called the "bottom floor." So I just landed in New York coming back from Dubai and now I’m stuck on the runway with like 1000 police, ambulances, fire trucks, this is crazy.